another month, another taste and create. arranged by nicole from for the love of food, who pairs up bloggers who then cook a recipe from each other’s blog. this month i’ve been matched with gay, a scientist in the kitchen who lives in the philippines. obviously this meant i had to choose a recipe for filipino food from her blog! there was lots to choose from but when she described adobo as “the most popular dish from the philippines … considered a national dish” i knew i’d found my recipe. adobo sa gata, which is a version of adobo that uses chicken and coconut milk, to be precise. gay’s recipe for this was given to her by her dad and i followed it to the letter despite (or perhaps because) it is a very different way of cooking from that which i am used. putting all the ingredients in a pan and letting them simmer together is something i’m used to doing with vegetables, but not with meat (i’d have normally fried the chicken and garlic together a little beforehand). however, trying new things is what this is all about and the end result was delicious! the adobo has a garlicky, salty and sour flavour, as gay described, but it also had a nuttiness which added richness and depth . it tasted very different to anything i’ve cooked before and yet was somehow familiar. the sauce is made from vinegar and soy sauce which is not a combination that i’d instinctively trust so it was great to see how these flavours worked together. and retrospectively, i’m used to using chinese vinegar with soy sauce in certain dishes so perhaps it should have felt more familiar. gay, thank you for being my partner and thank you for showing me that the unusual isn’t really that unusual at all, especially when it comes down to delicious healthy food! check out gay's version of my pasta puttanesca. cook the broccoli until just tender - don’t salt the water as your adobo sauce will already be quite salty. 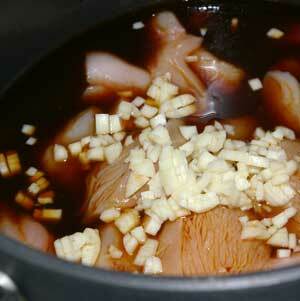 combine the chicken, vinegar, soy sauce, garlic, pepper and water in a pan. bring to the boil then simmer until the meat is tender (i cooked mine longer than necessary as the garlic still tasted a little raw even though the chicken was ready). add the coconut milk and simmer for a few minutes until the coconut milk starts to release oil and the adobo becomes creamy. add the cooked broccoli and serve with rice.